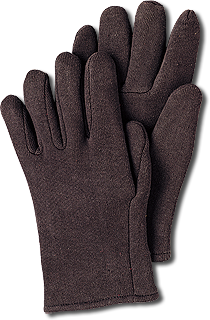 Lightweight, mens reversible inspection glove. Ideal for waiters and food handlers. Great for protecting small items from fingerprints and smudges without losing sensitivity. Same as CI-110 in ladies' size. 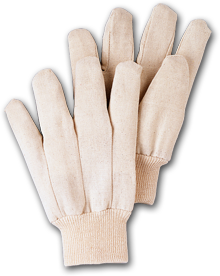 Longer gloves also available. 9oz. 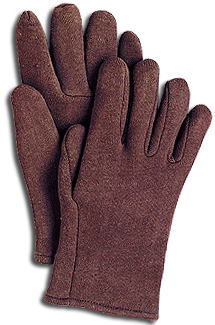 fleecy brown jersey glove. Clute pattern with knit wrist. Fabric streches to provide better fit for general purpose. 26 oz. 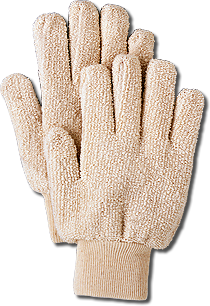 gunn cut reversible terry cloth glove with knit wrist. Used in bakeries for heat protection. Band top and 41⁄2" gauntlet also available. 14 oz. brown jersey with red fleecy lining. For cold weather comfort style. Slip on style. Jersey reversible glove natural white color. 9 oz. fleecy brown jersey with P.V.C. 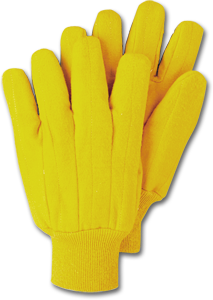 dots impergnated on surface of glove..
Gold double fabric palm chore glove for multi-purpose use. Knit wrist style with white cotton canvas back, white knit wrist. Men's large size. 8 oz. 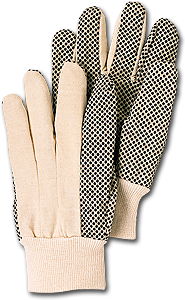 white cotton flannel glove, clute pattern with knit wrist. Good for light duty assembly and maintenance work. Reversible and band top styles available. Same as WC-800, ladies size. 12 oz. 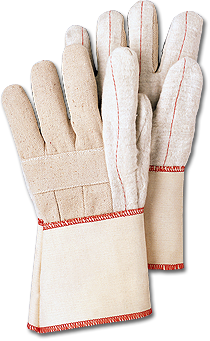 cotton glove for those extra heavy duty jobs where the feel and dexterity that cotton offers are important. Knit wrist. Plastic dotted glove. Scores of black plastic dots are impregnated into the surface of a 10 oz. 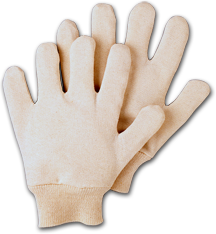 cotton glove. For use in handling slippery items such as cardboard, glass or sheet metal. 18 oz. 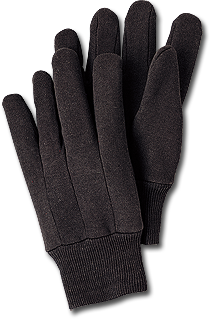 double palm glove used for moderate heat protection and high wear jobs where single layer gloves wear to fast. 24 oz. 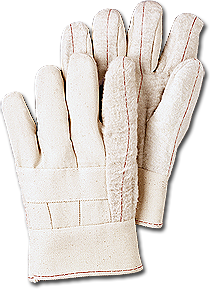 Hot mill glove, double quilted palm, thumb, and index finger, with a knuckle strap, seams in, and a 2 1⁄2" band top. Same as HM-2600 with 5" gauntlet. 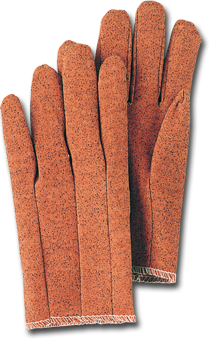 Stretch vinyl impregnated glove. Stretches for a perfect fit. Provides excellent dexterity and grip. The SV-200 is water repellent. 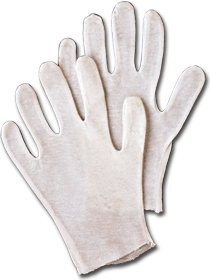 Replaces cotton and goatskin gloves. Same as SV-200, ladies size.